Happy Friday everyone, Kirsten here, it's been quite a while. Things are still very much all over the place, but slowly, some semblance of normality is returning. I saw Lisa on Tuesday, just before she left for Shepton Mallett & we worked out some new arrangements for the blog & discussed her plans for the next few months. It's going to be busy! I also saw the projects for next month's Maidstone class - they are gorgeous, I think everyone will love them. I haven't got any new projects to show you today, I've been busy on my own pieces, but I wanted to remind you to keep visiting the website & checking the What's New section. 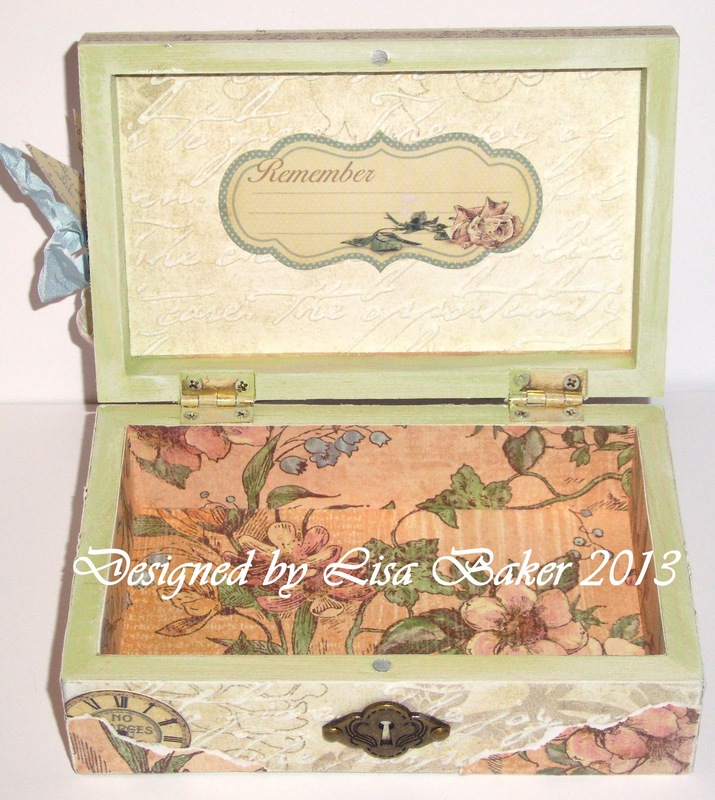 Lisa has added the new Graphic 45 papers. If you saw them at the class a few weeks ago, you'll know how lovely they are. This is the Delicate Details 12x12 paper, which I used on some of my class samples & really liked. There's some new wooden pieces available too. 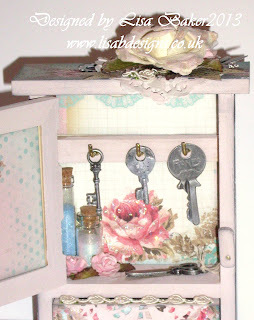 This is the little key cabinet that Lisa altered for this blog post. I got some of these little glass vials from Lisa on Tuesday. They're very cute & perfect for adding an embellishment to your project. Just fill them with glitter, or seed beads & glue them on with a wet glue. All of these items are on the first page of the What's New section, as well as on their own individual pages, so take a look. The April challenge is continuing for a few more days, so there's still time to enter. Georgina entered a beautiful card earlier today, I love the colours she chose. You can see her card & all the challenge details here. Have a great weekend & happy crafting. Good morning, Kirsten here with another scheduled post. It’s the start of a new week, I hope everyone had a nice weekend. These are two more of the projects I made for the April class. I used patterned papers from the Graphic 45 Ladies Diary collection on the MDF plaque & from the Scrap Cake One Moment in Time & The Bright Side of Life collections on the MDF heart. The printed, die cut tickets & tags are from the One Moment In Time collection The Scrap Cake too. I put Versamark through a stencil on the heart, then covered it with pink Fran-tage EP & heat set. These embossing powders have tiny particles of glitter in them, which add a nice touch of glitz. As in previous posts, the little bird is from Craftwork Cards. Until next time, happy crafting. 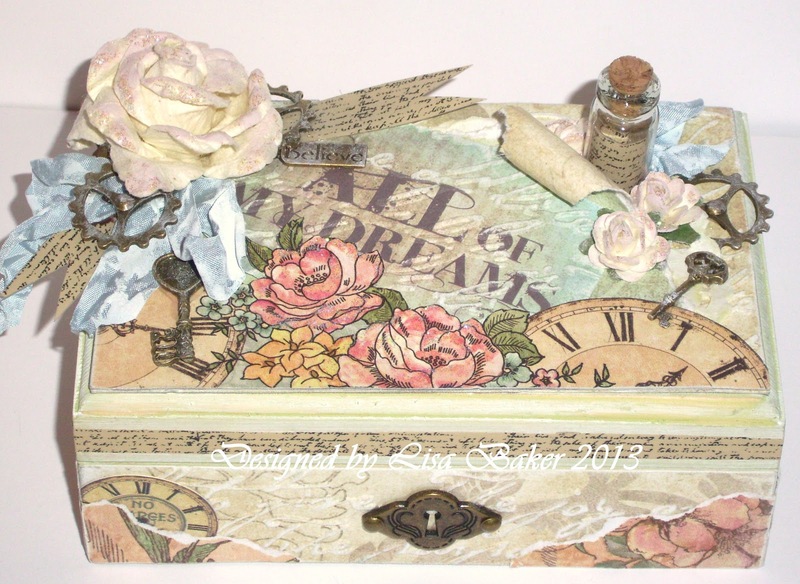 As you know if you have been following my blog that I have been designing, making and posting a lot of altered art projects that I made for my workshop on 5th April. I also showed you the beautiful boxes that the ladies made at the workshop. 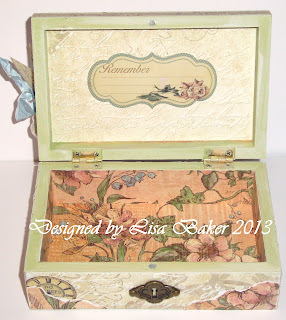 Now I am going to share with you the lovely Vintage Memory Box that I am teaching for the UK School of Craft at J and C Creations Warehouse on Thursday 9th May from 10am until 4pm. On the day you will create a this beautiful altered art box and a tag. Learn how to style a blank canvas to create an impact, creating it all from scratch. 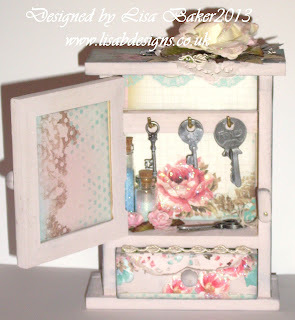 You will go away with this stunning box and a memory tag to keep all your treasured possessions safe and sound. You will also have a goody bag to go home with with lots of left overs in to use on other projects. Well that's about all for now. If you like what you see and fancy giving it a go then click on the logo or HERE to find out more and get yourself booked on the workshop. Good morning, happy Saturday, Kirsten here with a scheduled post. There's still too much going on for me to post regularly, so I've had to write a few posts at the same time & they will be published as & when. Hopefully, 'normal' service will be resumed at some point. I'd like to show you three of my projects for last week's class today. The first one you might recognise from this post. I started off by covering the MDF plaque with a piece of Parlor Wall paper from Graphic 45's Olde Curosity Shop collection, which I added splats of Rusty Hinge & Frayed Burlap distress stains to & blended a little Vintage Photo distress ink on top. 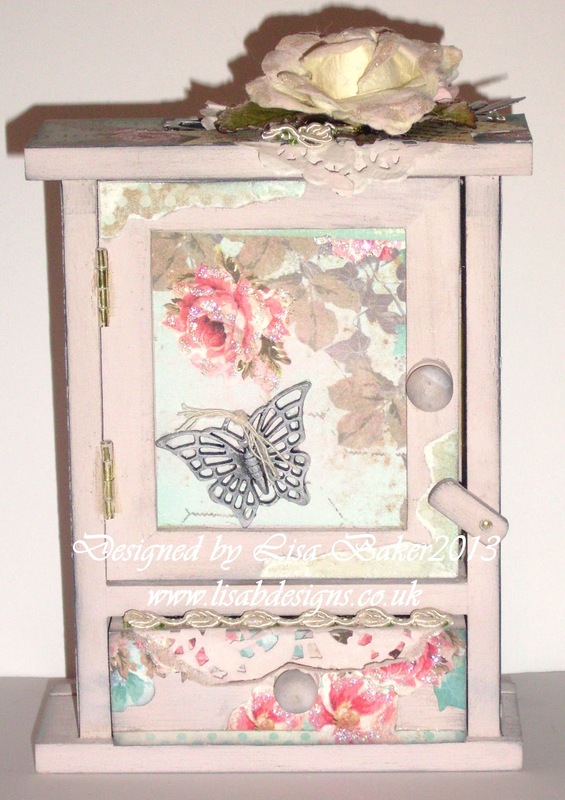 The central butterfly was stamped with Versamark & covered with WOW's copper EP & the other butterflies were coloured with Weathered Wood distress ink. When I'd put the piece together I flicked water over it & very quickly put Fran'tage EP on top, then heat set. I did the same with the flower. 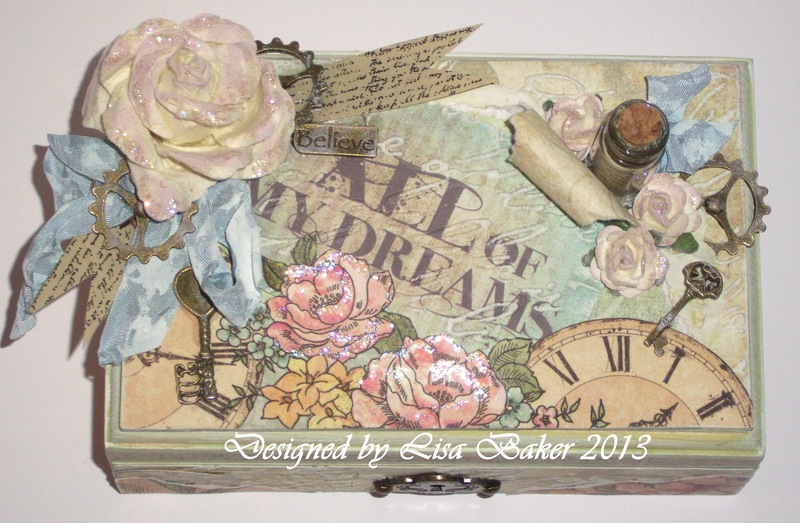 I needed a very small quote for this & the only suitable one I had was a Tim Holtz stamp from my stash. This is on an 8x8 card blank. The patterned paper is layered onto core'dinations card. The pattern was very subtle, especially after I added distress inks - Vintage Photo, Walnut Stain, Tea Dye - so I stamped the Kanban images with black Archival ink. The bird & kraft birdcage are Craftwork card, (I stamped onto the cage with black Archival ink & heat set with WOW's Clear Sparkle EP), the bird's wing is the heart-shaped centre of the cage. 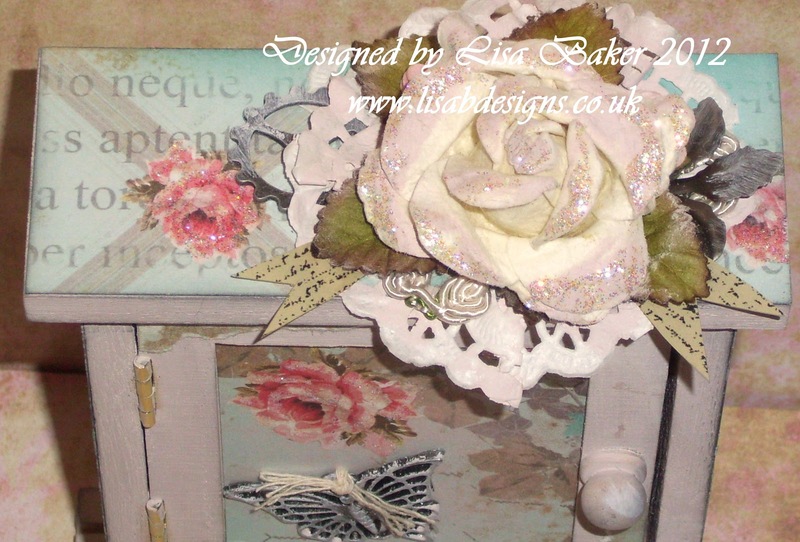 The flower is Hobby House & Crafts Too & the ribbon is a scrap from my stash. This is another 8x8 card. I put the stencil on top of a piece of linen textured card & pushed Versamark through it, removed the stencil & put black EP onto the card. After heat setting & letting it cool, I blended distress inks - Tea Dye, Walnut Stain - on top, leaving it patchy. The torn, patterned paper is G45; Before Your Time from their Kraft Recollections collection, I blended distress ink over it too. The piece of paper on the lower corner is just a piece of copy paper, stamped & 'aged' by crumpling & distress inks. I added lots of metal embellishments to finish, details below. Thanks for visiting the blog today & before I go, just a reminder about this month's challenge. All details are HERE. 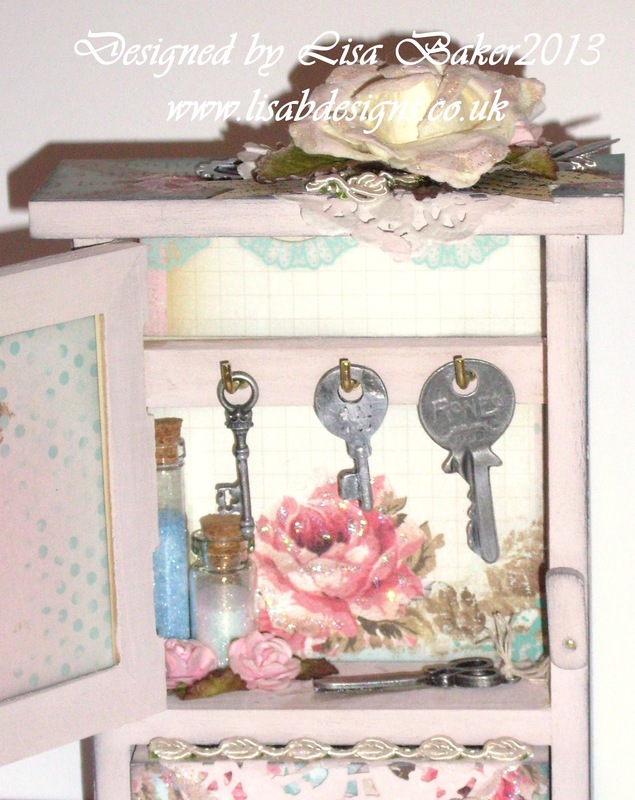 I thought I would show you today the little Key Cupboard that I created for my workshop last Friday, which are available on my website HERE. Like the other items that I have posted previously, I painted it with pink acyrilic paint and added a little Distress Ink. Well that's all for now, enjoy your day and I will be back soon. Hello, Kirsten here, it's been a while. 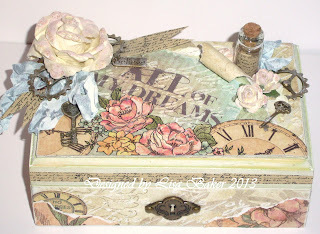 I was sorry to miss the class last Friday, it looks like everyone had an enjoyable time & created some beautiful boxes. 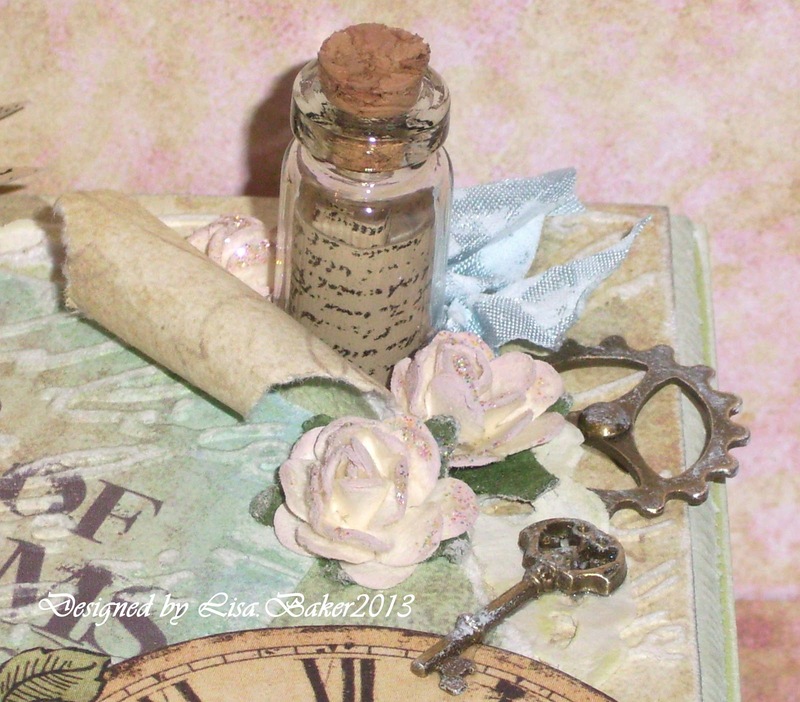 If you missed Lisa's post about the class, you can see it HERE. We'll be sharing blogging duties over the next week or so to show that we made for the class & I'm starting my posts with two projects; a secret drawer & a wooden plaque. I altered the outside by first gluing various bits & pieces from my stash to the wood, covering with gesso & painting with layers of acrylic paint (Rangers' paint dabbers in Willow, Aqua & Lemonade). The bees & dragonflies (Artemio stamps) were stamped onto tissue paper, coloured with Spectrum Noir pens & attached to the box with wet glue. The image is from the Picture Perfect sheet of Graphic 45's Ladies Diary 12x12 paper collection, I covered it with Crackle Accents & added seed beads. Adhesive pearls & buttons were extra embellishments. The inside was decorated with more of the G45 Picture Perfect paper - it's double-sided, so there are elements from both sides here. I cut more images & 'hung' them on the back. The dress form is Craftwork Cards. There are close up photos in this post. You can read more about this 'clock tower' & see some close up pictures in this post. I made the roof by scribbling Spectrum Noir pens over a piece of metal card & adding blending solution. 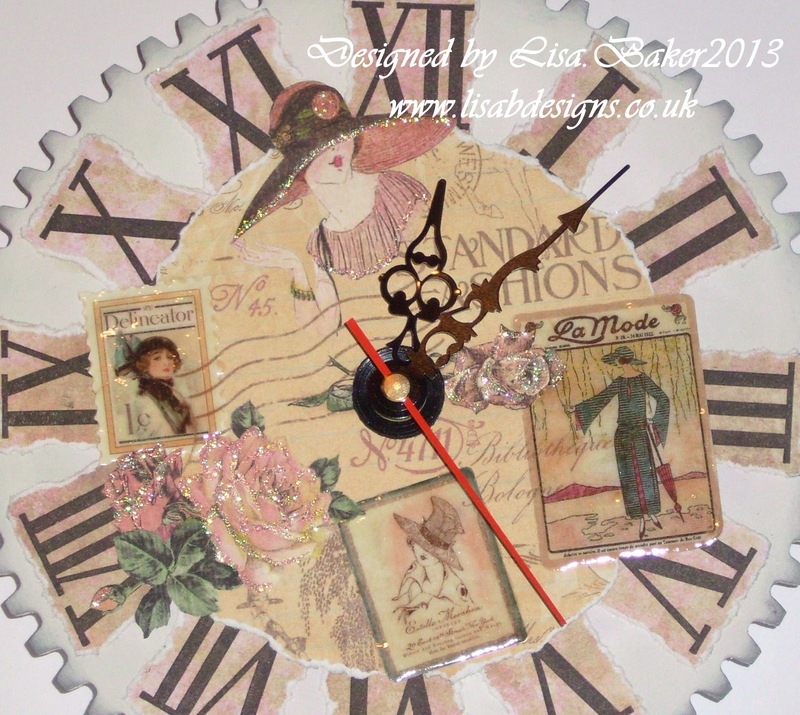 I used Graphic 45 papers on this too; the Delicate Details & Timeless Memoir sheets from the Ladies Diary collection, adding a little modelling paste mixed with copper coloured metallic paint to give more texture. I liked how this turned out with the copper embossing powder on the black card & stamping the hands & outside of the Kanban clock image onto acetate. The bird is from Craftwork Cards. Thanks for visiting the blog. It won't last long though, I know as I get busy again time will get short but I am enjoying it for now! 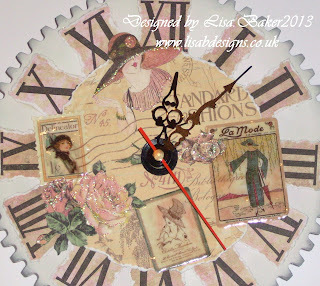 I thought that I would share with you today, the altered art Indigo Blu clock that I made as a sample for the class on Friday and is available on my website HERE. I kept it very simple and firstly painted it with white acrylic paint and then added a little Black Soot Distress Ink. I used the Indigo Blu Clockwork stamp set with black onyx versafine ink on to one of the co-ordinating papers and tore around them and stuck them to the clock. 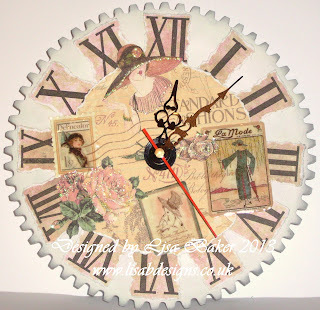 I then chose my perfect picture paper from the Ladies Diary Graphic45 collection available HERE and drew a circle in pencil and then tore the circle until it met a main image and then cut around the image and then carried on tearing in between another image until I had my full circle to attach to the clock. Well that's all for now, I hope to bring you a few more altered art inspiration this week and I know that Kirsten has also got some in store for you.